I read it when I was 11. I got it on the Ferry, on a whim, and it propelled me into a 7 or 8 year Dragon loving Science Fiction addicted odyssey which I will happily admit is ongoing. Although I haven't read anything with Dragons in it for a while. I remember too, that my childhood best friend Zoe read them with me at one point (I have read the series several times don't you know) and I got "The DragonLover's Guide to Pern" which I just unearthed from under my parent's house for my birthday when I was 13 or something and OH MY GOD we LOVED it! We made recipes out of it and everything. 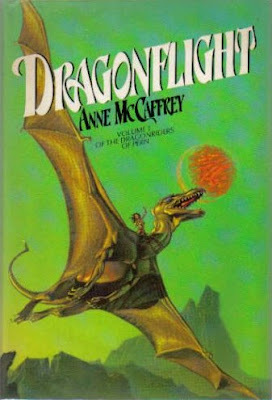 But I started into DragonFlight last night after work and holy crappers I am as addicted now as I was then! I poured through 3/4 of it in one sitting, remembering the story as it unfolded and picking up on WHOLE new themes in it as an adult which I totally missed as a preteen. And I am sure that I cried in the same places as my 11 year old self too. It is so good. So I am thinking that I will likely finish it tonight after a few solid hours in the studio, stay up too late to finish it and quite possibly have to reread the ENTIRE SERIES again. The artwork kills me! 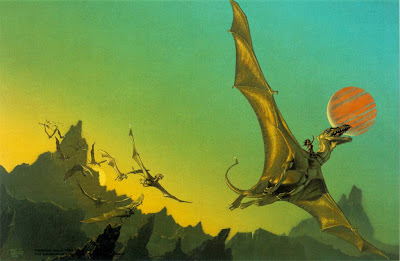 I remember being totally blown away as a kid, wishing that I could Impress my own dragon. Maybe I still do, whatever.